Start with the Data Sheet for the HD44780U Notice that the power up reset, although it does leave the display in a very nice state (page 23), depends on a power supply situation that may or may not be realistic: Rise time from 0.2 to 2.7 or 4.5 volts must be between 0.1 and 10 milliseconds (as per page 50 and 53) for the hardware reset to work. 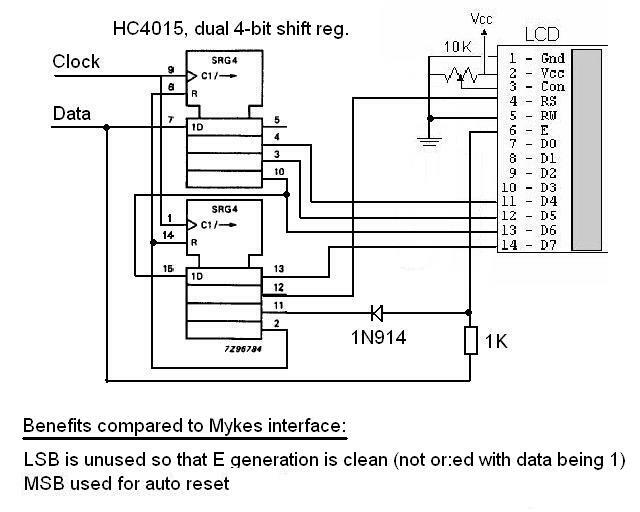 The commands to Initialize the display are described on page 45 (for 8 bit interface) or 46 (for 4 bit interface). Now we can setup the display with the "Function set" command (page 24 and 27). This command is unique because the upper 3 bits (DB7, 6, and 5) are set to 0 0 1. If you are going to use all 8 data lines to talk to the chip, you will send this command with the "DL" or "Data Length" bit (in the DB4 position) set, and that bit will be cleared if you will use only the upper 4 lines (DB7-DB4) to transfer first the high nibble, then the low nibble of each byte of data. You also have to select between the 5x8 and 5x10 pixel fonts, but the 5x10 font is only available on special one line displays . And you must select the number of display lines, but since a 1 line display will work just fine (on the first line) with the 2 line bit set as long as you use the 5x8 font, we almost always just clear "F" and set "N". So use 0x38 (56 decimal) for 8 bit interface and 0x28 (40 decimal) for 4 bit. If you clear the DL bit, putting the display into 4 bit data transfer mode, then you have to start pulsing the E line twice for each command, placing the upper 4 bits of your data on DB7-DB4 for the first pulse, and the lower 4 bits of your data on those same wires for the second pulse. Since these 4 bit transfers don't start until after that bit is set, you actually have to send the "Function set" command twice: once while still in 8 bit mode using just one pulse on E, where the N and F bits are lost (because you couldn't set DB3-DB0) then again in 4 bit mode using two pulses on E, to set or clear the N and F settings. That was a total of three pulses on E for the two Function set commands because the first one was in 8 bit mode and the second was in 4 bit mode. Other than that, operation continues the same in 8 or 4 bit mode; the only difference is the extra cycle to transfer the lower nibble of each byte of data when in 4 bit mode. Now that we have the chips attention and have established full communications with it, we can finish up the initialization. The data sheet actually says you must do it like this: Display off, Clear display, Entry mode set, but a lot of people seem to get away with turning the display on (with or without cursor / blink) right at the start or doing other funky things. Since it's just one extra command, following the datasheet exactly is recommended. Command 0x08 (8 decimal) to turn the Display, cursor and blink off. Command 0x04 (4 decimal) to set the Entry mode. Add 2 for "I/D" if you want character position to Increment instead of Decrement and plus 1 for "S" if you want the display to scroll around the cursor. See page 26. Usually, you want the cursor to increment and move, so use 0x06 (6 decimal). Once the display is setup and running, here are some commands you probably want to use. We will list them as defines since that format is probably the most useful. #define LCDOff		8	;0x08 turn the display (and the cursor) off. Developing an LCD driver interface for the LM032LN display took me a lot longer than expected, especially UDGs, and I traced it to quirks in the HD44780A00. Commands need to be sent twice for reliability. Characters output are no problem though. The address position command for uploading UDG information needs not only repeating, but also given a settling time - I gave an arbitrary 1.5 ms after each command before sending data. I also found that "ASCII" 00h, a UDG, is what the display writes as spaces, thus for a clean display this needs to be filled with blanks. Thus I've effectively got only 7 available UDG characters, not 8. I also found that placing a bit of ferrite around the EN, RS and RW lines seems to help reliability - the circuit is on a breadboard at the moment. Since the chip will not initialize using busy-polled command routines, I have to use a paced one for initializing, and for simplicity all commands sent are paced. So I'm using a paced driver for sending commands, and a busy-polled driver for sending character and UDG data. The display is now working reliably, but its had a lot of aggro (over 80 chip rewrites in the course of debugging). So now instead of write piecemeal to the display I've employed the KISS principle, using RAM in the PIC 16F877 as a display buffer - use that and forget display idiosyncrasies... Periodically uploading that to the display takes just over 4 ms. All my PIC routines are interruptible, and the code is written for the PIC16F877. I've got the EPE Feb-Mar 1997 articles "How to use intelligent LCDs" (and the original magazines), from the vendor of my displays have a photocopied datasheet for the LM032LN, from the internet have 2 or 3 datasheets for the HD44780, have AN587 and from various PIClist-derived websites have various peoples' comments on how-to with this display. It seems they are necessary, sadly. But all the way along, and especially on this list there have been complaints about difficulties with UDGs. http://w1.864.telia.com/~u86435834/2wire4015_lcd_R2.jpg An HC4015 dual 4 bit shift register takes only two io pins, but allows for E to be generated separately (and time shifted by a clever diode "and" gate with the clock) and for the register to be reset by the MSB when the clocking over flows.